USMC doctrine requires that certain units, such as FAST (Fleet Antiterror Security Teams) and Force Recon, to participate in FMF (Fast Maneuver Force) tactics, utilizing small, agile, well-armed vehicles. Since they have long become accustomed to getting the short end of the DoD budgetary stick, the USMC made due with hand-me-down dune buggies from the Navy, former SEAL FAVs, as well as a small fleet of modified M151 Mutt Jeeps that should have been cycled out of service in the early 1980’s. By 1998, most of the Mutts were on their last legs, and the decision was made to replace everything. The M1511 Interim Fast Attack Vehicle is the designated replacement, based on the Wolf light military trucks so common throughout Europe. The M1511 is a 4WD commercial vehicle, purposely modified at the factory level to meet military standards. The truck is fast, agile, armored, and with the latest units entering service, heavily armed with multiple machine guns and rockets, all with a formidable cross country capability that seems able to take it anywhere. 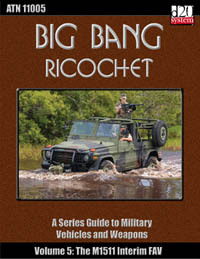 Included with this issue of Big Bang Ricochet is an Entry for the Mk. 19 Mod. 0 Automatic Grenade Launcher, a staple weapon of the USMC, USN navy SEALs and the US Army Military Police Combat Support Heavy Squads.